This evening the buses that usually bring me home were not working. As I was walking back, a total of 45 minutes, a car stopped by me. A local family offered a ride. This is Polish hospitality and the kind of spirit we are all living here in Krakow. We are all a big family in Christ. Speaking about our family, today we had the Regnum Christi Mass. All RC groups gathered in a big parish called St Jan Kanty. It was wonderful to see the church completely full with young people from all over the world. The Mass was in Latin and the homily was delivered by Fr Andreas Schöggl in different languages. 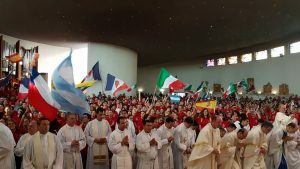 After the homily, eight young men and women from Mexico were incorporated into the Movement. We were all wearing our RC T-shirts, which said in the back “meRCy”. After that we had the Stations of the Cross with the Holy Father. Each one of the fourteen stations was related to a work of mercy. During his speech, Pope Francis asked “where is God in so much suffering in this world”. He said that Jesus answers us telling that God is present in all those who suffer. Tomorrow we have the Vigil with the Holy Father in the “Field of Mercy.” I invite you to join us praying for the whole world and celebrating the divine mercy! Br Antônio Lemos is from Curitiba, Brazil. He joined the Legion of Christ in 2006 after a couple of years as a Regnum Christi member. He is a big fan of the Brazilian national soccer team, 1980´s pop culture (specially movies), and St Thomas Aquinas. He is currently studying Theology in Rome.